With the 1986 film “Eliminators,” the joke is the punchline. I purchased this “4 Sci-Fi Movie Marathon” for a few dollars from Amazon specifically to see this movie. I had fond memories of it when I was a child. I remember renting it on VHS from the local video rental store and catching it on HBO when premium cable channels were still a relatively new thing. I had images of a half-man, half-tank cyborg rolling around and shooting people with lasers, an even more powerful and evil cyborg that was planning to travel into the past when civilization was still young and dominant mankind as an immortal god-emperor, and a somewhat tragic ending. There was this lingering sense of drama and building suspense and intrigue. All of this demonstrates how memories alter over time. The bad, if it was even understood, gets worn away and only the pleasant things remain. Time doesn’t heal all so much as it obfuscates the past for you. Because Eliminators is not a good movie. And without alcohol or a group of friends, it’s not even that funny of a B-movie, because it drags. The basic plot involves evil Dr. Reeves and his assistant Takada creating all sorts of technological marvels in a compound deep in the Mexican bayou/forest/wilderness. One of their wonders if the film’s protagonist, the Mandroid. The Mandroid was once a pilot that crashed along the river leading to the compound and Reeves and Takada re-purposed his human body by supplemental it with robot parts intended for space exploration. The Mandroid only has the barest fragments of his human past and follows the orders of Reeves and Takada as they use him as a test pilot for their time machine. Yes, Reeves and Takada built a time machine and they’ve send the Mandroid back to the Roman Empire at least once where the cyborg returned with a centurion’s shield and no memory of how he got it. Spoilers, he blasted a bunch of roman soldiers with his arm laser cannon and took it. After this successful use of the time machine, Reeves orders Takada to dismantle the Mandroid as they no longer need him. Takada is appalled by this and argues against it but seems to bend to Reeves’ will. So, Takada takes the Mandroid aside and explains what Reeves intends and the Mandroid agrees to escape the compound with Takada, after securing his mobile unit (tank tracks, see pick below). During this escape, we also learn Reeves is not in good health. He plugs himself into a machine to filter something from his body, but the Wily scientist has a plan to prolong his life. Takada is shot by one of the many plainclothes guards protecting the compound while assisting the Mandroid in his escape, but he lives long enough to tell the Mandroid to seek out a Col. Nora Hunter (played by Denise Crosby of Star Trek: TNG fame). And the Mandroid takes several shots from a ridiculously modified rifle fired by Reeves’ top enforcer, Ray. Poor Ray gets left out of a lot of plot synopsis but he does cause a lot of headaches for the Mandroid. Though damaged, the Mandroid escapes the compound and rides into the wilderness. He eventually discards his tank half and reattaches his legs through the miracle of film editing. Not long after, we’re introduced Nora. She’s some sort of scientist/engineer. She’s tinkering with a semi-artificially intelligent, gallon-of-milk-sized robot called S.P.O.T. (Don’t ask what the acronym means; it’s stupid) that’s designed to be an advanced scout and tracker. And it has flight and matter teleportation abilities. It can zip around rapidly as a ball of colored light. The Mandroid forces his way into her lab and reveals himself to her. There’s an exchange of exposition. Nora’s ticked that Dr. Reeves has been stealing her designs and using them for no-good. The Mandroid is based on her designs and she even offers to fix his damaged parts. He’s reluctant to take her with him to confront Reeves and stop his evil plans, but Nora’s persistent and the Mandroid does see a benefit in having her and Spot. While driving into Mexico, the pair run across a pair of carjackers and the Mandroid is forced to intervene. He blows up their car. The plot continues. The pair get a hotel room somewhere in Mexico. The Mandroid and Spot fight over the TV channel. Nora goes to a local bar to find a guide to take them up river to find Reeves’ compound. The Mandroid doesn’t know how to find his way back for reasons and only has a general idea. This is where we’re introduced to the Han Solo/Yamcha of the adventure in Harry Fontana. Harry is a weasel of a riverboat pilot, but he’s clever enough to outsmart all the other local competition like his primary rival, Bayou Betty. Nora draws a lot of attention when she enters the seedy Mexican tavern because she’s pretty and declares she wants the toughest guide in the place. This prompts Betty to bunch her own crewman in the face and begin a tavern brawl designed to anoint the last man standing as the toughest guide worthy of taking Nora upriver. Harry stays out of the brawl until the very end when Betty is the last person standing, clocks her on the head with a beer bottle, and then strolls out to accept Nora’s job. It’s worth mentioning that this movie shares a lot of bizarre commonalities with both the original Dragon Ball and Star Wars: A New Hope. The trio of Goku, Bulma, and Yamcha match up pretty well with the Mandroid, Nora, and Harry. The same is true for Luke, Leia, and Han in the same order. Maybe that was just a really popular triangle of characters back in the day. The Mandroid disguises himself as a wounded friend of Nora’s by wrapping his cybernetic head in bandages and weather clothing to hide the rest. Harry is initially suspicious, if not jealous, but agrees to take the Mandroid, too, for some extra money. This is where the film gets tedious. It felt like the next half hour consisted of a drawn-out, badly-done speedboat chase where the film crew was limited to some stock footage, a very small body of water in which to film, and some use of either a projected background or green screen. Bayou Betty and others chase Harry and his boat, shooting shotguns at the heroes to try to force Harry to forfeit Nora and the Mandroid to them so they can make the money from the guide job. Yeah, it doesn’t make sense. Neither does Harry’s constant zigzagging, the fact his boat doesn’t leave a wake in any of the scenes, or that there’s little to no wind affecting Nora’s hair during this high speed boat chase up river. And of course Harry’s boat has sudden engine troubles (like the Millennium Falcon) he can’t fix, but Nora can. So she does, but it’s not enough and the Mandroid has to intervene by launching a torpedo to take out Bayou Betty’s boat. And these poor boats gets used in at least two more chases just as ridiculous. The Millennium Falcon Harry’s boat is not. Skipping ahead, the Mandroid and Nora try to ditch Harry and do for a while. They find the plane in which the Mandroid crashed and he learns he once had a family. Nora almost drowns after swimming into the crashed and partially submerged fuselage, but it saved by the Mandroid casting a line to keep the plane from sinking completely and Harry returning in the nick of time to chop some tree branches out of the way so Nora can swim free. Harry learns the truth and story of the Mandroid and is determined to help. I’m skipping the part where Ray found Bayou Betty in the water and learned that the Mandroid was around. Ray then caught up to Harry, but Harry pulled a few tricks and wrecked Rays’ boat. It was boring. Moving on, the trio re-board Harry’s boat to go further up river rather than try to find a way through the “jungle” by way of old Indian trails. Along the way, the Mandroid falls overboard for some reason and Nora and Harry can neither find nor retrieve the metal man from the deep river water. Upset, they vow to continue on the quest to stop Reeves. Then Harry’s boat engine craps out for good and the pair go on foot where they are captured by cavemen. Yes, cavemen, neanderthals. It’s never explicitly explained, but it hints that Reeves has been making many trips into the past and returning with all sort of artifacts. Later on, he’s shown to have a vault full of ancient roman items. The pair manage to escape when Harry steals a kiss to give Nora some bullets to toss into a fire. They’re eventually reunited with the Mandroid who managed to walk out of the water and come across a real life ninja in the form of Kuji Takada, the son of Takada who has been searching for his father. Altogether, they locate and assault Reeves compound. The Mandroid recovers his discarded mobility unit and rolls around shoot lasers at hillbilly’s on modified three-wheelers until he gets tipped over and has to go back to his legs. They concoct some plan where the Mandroid will distract Reeves and his guards while the other three sneak inside and sabotage the time machine. Nora deduced what Reeves was planning after piecing together the Mandroid’s story and her understanding of the technology Spot uses to transport around. It’s during this infiltration that Kuji ninja’s his way through a spinning fans without being touched by the blades. And Harry sets off an alarm by trying to remove an artificial from Reeves’ roman collection. The three are captured and brought to the courtyard where they are used as hostages to force the Mandroid to disarm (literally) his laser cannon. The Mandroid complies, but Kuji gets the drop on the guards and another fight ensues with the heroes beating Ray and the other henchman. It’s at this point the Mandroid demands Reeves come out and face him. And Reeves does. This might have been more shocking if it hadn’t been shown earlier. Reeves emerges as a blood-red, Roman Emperor version of the Mandroid. He’s a far more advanced cyborg. In the earlier scene, he was shown tinkering with a lightning cannon mounted on his forearm that also acted as a kind of telekinetic beam. He used it to grab Ray by the balls, akin to Dark Helmet from Spaceballs, to further motivate the poor guy into stopping the Mandroid. It didn’t work. This improved cyborg body is way too much for the already damaged Mandroid and Reeves blasts our hero multiple times with lasers before leaving the Mandroid for dead in the courtyard. He then traps the remaining three heroes in an ever-shrinking energy force field that threatens to crush and electrocute them to death, while he goes inside to fire up his time machine and become the god emperor of Rome. Fortunately for civilization as we know it, the Mandroid recovers long enough to crawl over to the trio and sacrifice himself by grounding out the charge of the force field. The trio don’t have time to mourn their friend because they need to hurry to stop Reeves from traveling into the past and the movie needs to end. By the time they find Reeves, he’s already in the time machine and traveling into the past. Nora tries and fails to hack the control computers as the date on the screen winds closer to the Roman era. Harry bemoans he didn’t learn about computers and wipes and punches a keyboard, causing the control system to short and Reeves to overshoot his target by millions and millions of years into the past, probably to become the god emperor of the Engineers from Prometheus. The movie cuts back to the group realizing the stopped Reeves. They cheer and laugh and the frame freezes on them. Credits roll. The Mandroid’s carcass still lies warm in the courtyard with no further mention made. Tragedy. So, that’s the basic summary of the plot. I can understand why I might have liked this movie as a kid. It has robots, cyborgs, time travel, and ninjas. I mean, there you go. But it doesn’t hold up, even as a good, bad movie watch. It’s too slow. Though, it may be serviceable with drinks and friends and might make for an interesting remake with a little more thought put into it. The same can be said of another movie in the 4-pack. 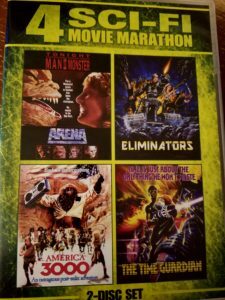 Arena (1989) does right what Eliminators did wrong. It moves much faster, almost too fast, and doesn’t linger on stretching it’s run time out with sequences it had no business trying to film. But Arena is worth its own blog. Lastly, there is no explanation why Eliminators was titled Eliminators given in the movie.